Congratulations to Professor Miguel León-Ledesma on his appointment as Fellow of the Centre for Economic Policy Research (CEPR). The prestigious CEPR is a research network of economists established in 1983 to enhance economic policy making in Europe. Based in London, CEPR’s network of Research Fellows and Affiliates includes over 1,000 of the top economists in the world conducting research on issues affecting the European economy. Miguel has been appointed Fellow of the Macroeconomics and Growth programme area. This entry was posted in General, maghic, Research on January 7, 2019 by tjg. The deadline for applications to the UK’s first degree-level apprenticeship in economics, provided by the University’s School of Economics, is 20 January. The partnership between the University and the Government Economic Service (GES) will see Kent’s School of Economics deliver the apprenticeship in conjunction with its Centre for Higher and Degree Apprenticeships. The Government Economic Service Degree Level Apprenticeship programme will create new routes to careers in the Civil Service for young people who would prefer to study for a degree whilst working at the heart of government. The apprenticeship standard on which the programme is based was developed by a group of economist employers. These included HM Treasury and the Bank of England as well as a range of consultancies and third sector organisations. A range of central government departments and agencies will provide placements through the new programme, including: HM Treasury, Department for Work and Pensions, Department for Education and the Department for Environment, Food & Rural Affairs. The apprenticeship is available in locations across the UK: Manchester, Bristol, Leeds, Sheffield, Newcastle, London and York. Apprentices will receive a starting salary of about £22k in London and in excess of £20k nationally. The apprenticeship is fully funded therefore there are no tuition fees, and apprentices are guaranteed that 20% of work time will be spent on university-based education, which will be closely related to the job. The programme is open to candidates with GCSE maths at grade B (6) or above and 96 UCAS points – equivalent to CCC at A-level, MMM for a BTEC Diploma, DD for a BTEC Certificate. There are no age limitations, and enthusiastic applicants with other relevant qualifications or previous experience are welcomed. Once the apprenticeship has been successfully completed, apprentices will have four years work experience, an economics degree and the offer of a permanent job in the Government Economic Service. This entry was posted in General on January 3, 2019 by tjg. ‘In September 2018 the Government published a new Agriculture Bill. It marks a profound change in the design, delivery and rationale of agricultural policy in the UK. It is proposed that farming can only expect to obtain public financial support for the production of public goods, such as the provision of biodiversity, improving soil management and quality, and planting of trees. There is a great deal of emphasis on the environment and the delivery of the promises that have recently been made in the 25 Year Environment Plan. As a result, the most striking aspect of the Bill is the minimal amount of actual agriculture policy in any traditional sense. …Read the complete article here. This entry was posted in General, Research on January 3, 2019 by tjg. This entry was posted in General, Research on December 20, 2018 by tjg. by Dr Katsuyuki Shibayama, University of Kent. Discussion paper KDPE 1813, October 2018. A growth slowdown is a long-lasting, significant decline of growth rate. It is not specific to high-income countries. The economic model developed in this paper also encompasses the “middle income trap”; typical examples include Latin American countries. The standard economic growth theory tells us that low-income countries should grow faster because they tend to accumulate production capital at a faster rate (Solow effect). Actually, many countries has successfully escaped from low income levels, but, out of 101 middle income countries in 1960, only 13 of them is classified as high income countries in 2008; see Larson, Loayza and Woolcock (2016, World Bank). Extending Romer’s (1990) seminal paper, our model has an additional state variable, which we call the R&D environment, to capture social culture (scientists ’attitudes toward business, etc. ), legal system (including patent laws and property rights), R&D infrastructure (such as innovators’ networks and education systems), and so on. We can regard the R&D environment as an intangible social capital, which has the following two properties; (a) society accumulates the R&D environment as an (intangible) asset by conducting R&D; and (b) the R&D activities are more productive when the R&D environment takes a higher value. For (a), an important assumption is such an accumulation of social asset is a positive externality of the R&D activities; i.e., the researchers do not intend to improve the R&D environment, when they engage in R&D. For (b), we want to capture, for example, higher education institutions are better prepared for the commercialization of academic findings when business innovations and inventions are more active. In our model, there are two stable balanced growth paths (BGPs, long-run equilibria); one with positive R&D activities and the other without them. This is intuitively because of vicious and virtuous cycles. Around the BGP with no R&D, there is a vicious cycle; once R&D becomes inactive, it deteriorates the R&D environment, which itself discourages the R&D activities. Similarly, there is a virtuous cycle in the good BGP. If there are no shocks (or only small shocks) in the model, then the fate of an economy depends on its initial condition. In our model, depending on the initial state, its final destiny – good BGP or bad BGP – is predetermined. Note importantly that in our model, even an economy moves toward the bad BGP, still it grows at a faster rate in early periods through the capital accumulation (Solow effect); it fails to switch from the capital accumulation as a growth engine to the R&D driven growth. We argue that countries that successfully transited from the middle-income level have had a R&D environment good enough to attain this transition; such as Japan and West Germany after the WWII. This is the explanation of the middle-income trap in our model. If there are some shocks in the model, even if they are temporary, still they can have long-run effects. We assume that after a successful innovation, innovators can set up a firm, meaning that the firm value is the reward to innovations. Like Comin and Gertler (2003, AER), because the firm value is the present value of the current and future profits, R&D is more active in booms. Unlike Comin and Gertler’s ’medium cycle’ effects, however, business cycle fluctuations can have very persistent effects in our model; this is because a shock may push out an economy from one BGP to the other. For example, if an economy experiences a bad external shock, output, firm profit and firm value decline, which in turn discourages innovations. If such a bad shock is large enough and lasts long enough, the dormant R&D activities during the recession may deteriorate significantly, which hampers R&D even after the end of the negative external shock. In our model, this is the mechanism behind the growth slowdown in Japan and the U.K. There are several policy implications. First, to help escape from the middle-income trap and the long-lasting growth slowdown, we need a ’big push’. For example, a large scale ODA as a positive external shock may be required. Second, however, the type of ODA matters. In our model, improving production efficiency and increasing final goods demand do not help escape from the low BGP, because there are two effects that offset each other. On the one hand, these shocks increase the firm profit and firm value, which stimulates the R&D activities. However, on the other hand, the production sector and the R&D sector compete each other in the factor market (labour market in our model). Hence, in our model, if the production efficiency improves, the production sector absorbs more labour, squeezing out the R&D sector from the labour market. There is anecdotal evidence of type of phenomenon; e.g., Wall Street and City have taken many scientists from universities and other research institutes such as NASA. In addition, this story is in parallel with the leading exposition about the natural resource curse; if the extraction of natural resources are very profitable, the natural resource sectors absorb too much production factors such as labour, squeezing out high productivity growth sectors such as manufacturing. Hence, if they only improves production efficiency, building bridges, roads and power plants, for example, has little effect in total. Third, our numerical experiments suggest that the financial sector efficiency has a strong effect. If the financial market is malfunctioning, the firm value may be discounted unduly. In our model, because the firm value is the reward to successful R&D, such a mispricing of the firm value discourages the R&D efforts. This is reminiscent of the fact that the U.K. and Japan have experienced the growth slowdown after the financial market turmoil. In conclusion, this paper asserts that a sort of intangible social assets such as culture, legal system, etc. are important for R&D. Our model has multiple BGPs. Even though an economy has experienced a rapid growth via capital accumulation (Solow effect), it may fail to switch to the R&D driven growth (middle-income trap). In addition, even though a country successfully achieved a high-income level, it could slip down from the good BGP, particularly if it suffers from deep and long financial turmoil (like Japan and the U.K.). To regain the sustainable R&D environment, the model suggests the following policy prescriptions; (i) policy measures that directly affect the R&D productivity such as the subsidy to higher education and R&D tax credit and (ii) policies to improve the efficiency in the financial market. This entry was posted in General, maghic, Research on December 10, 2018 by tjg. 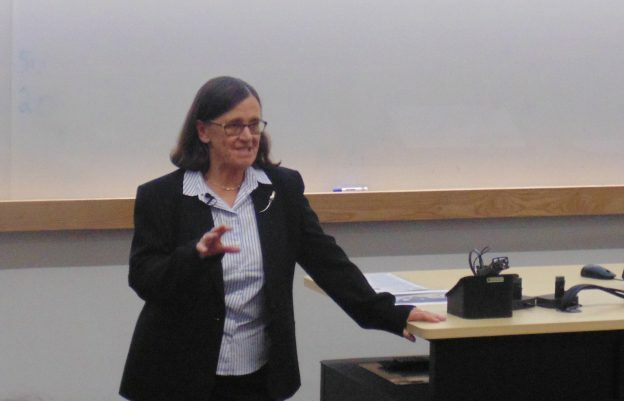 On Tuesday 13 November, we had the pleasure of welcoming Professor Denise Osborn to the School of Economics. 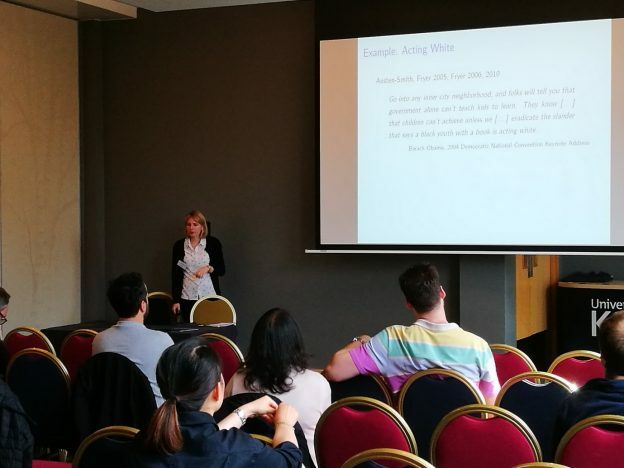 Both Secretary General for the Royal Economics Society and Emeritus Professor at the University of Manchester, Denise delivered an inspirational talk on the role of women in Economics, focusing on research and her own personal experience. Looking back on her career, she examined the perception of women in the field of Economics over time, comparing and contrasting the start of her career in 70s, where she was very much a minority, to now where more and more women are joining the field. Denise compared the gender distribution of researchers within Economics and looked into why Economics is still one of the lowest STEM subjects for its percentage of women. Denise concluded her talk by looking at the actions that are being taken to challenge gender norms and encourage more women to consider a career in Economics. The session finished with a lively Q&A session with the audience. This entry was posted in Current Students, General on November 14, 2018 by cm894. This entry was posted in General, maghic, Research on November 8, 2018 by tjg. This entry was posted in General, maghic, Research on October 20, 2018 by tjg. This entry was posted in General, Impact, Research and tagged workshop on October 15, 2018 by cm894. by Amrit Amirapu, University of Kent; M Niaz Asadullah, University of Malaya; and Zaki Wahhaj, University of Kent. Discussion paper KDPE 1810, September 2018. In this paper, we explore these issues in two steps. First, we construct a model in which women make marriage and migration decisions jointly – and under the constraints imposed by social norms. Then, we test the hypotheses of the model using the event of the construction of a major bridge in Bangladesh – which dramatically reduced travel time between the economically deprived northwestern region and the industrial belt located around the capital city Dhaka – as a source of plausibly exogenous variation in migration costs. Using this natural experiment along with data from a purposefully designed nationally representative survey of women covering 20 age cohorts (the 2014 Women’s Life Choices and Attitudes Survey or WiLCAS) we estimate the effects of a drop in the cost of migration to the industrial belt on (i) female migration; (ii) marriage patterns; (iii) female labour force participation; (iv) male and female educational attainment. In accordance with our model’s predictions, we find that the bridge construction induced changes in a range of outcomes, but only for those women whose families own more than half an acre of land (a commonly used poverty threshold). In particular, we find that such women are more likely to migrate towards Dhaka (by 5 percentage points), work in the urban manufacturing sector, pay a higher dowry and obtain more years of schooling. Importantly, there is a statistically significant effect on marriage-related migration but not on economic migration. The effect sizes – especially on migration – are very large in comparison to baseline levels of the outcomes. This entry was posted in General, Research on October 4, 2018 by tjg.